A report by WFYI in late January reported that nearly half Indiana’s county jails are over capacity. That’s no surprise here in Wabash County, as Sheriff Ryan Baker tells the County Commissioners every week during his jail report that the local county jail is over capacity 100 percent of the time. Wabash High School graduate Michael Palascak will bring his standup comedy routine back to the Honeywell Center on Thursday, Feb. 14. Palascak will perform in Legacy Hall beginning at 7:30 p.m.
Palascak was a finalist in NBC’s “Last Comic Standing,” and performed at the Honeywell Center’s Ford Theater as part of a comedy tour featuring the show’s finalists. A fundraiser to help a Ball State University student raise funds to participate in a class project in Europe is planned Friday, Feb. 22, at the Wabash Elks Lodge. Alix Latta will be traveling to England in March to study authoress Jane Austen. 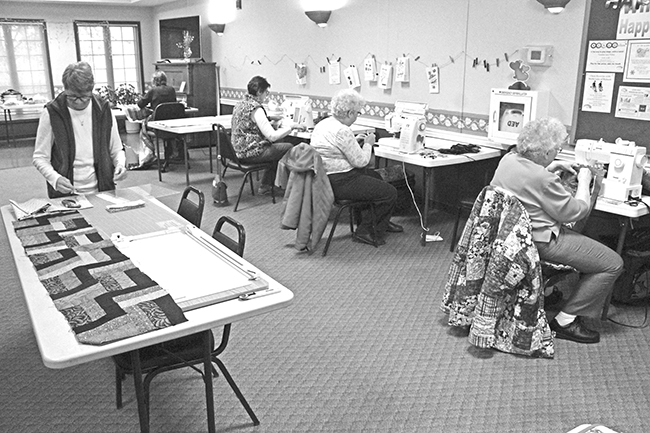 Volunteers work on quilts at the Dallas L. Winchester Senior Center. Photo by Joseph Slacian. The Blanket Binders program started in 2013 thanks in part to Claire Coyne, former director of the Lighthouse Mission. Coyne first approached Carolyn Kellam, a member of the Sew Pieceful Guild, about that organization overseeing the program.